The United States Mint’s most recent sales figures for bullion American Silver Eagles paints an interesting picture for the series. They show easing demand in August while still taking a giant step closer to making 2010 the best year ever for the .999 fine silver coins. The U.S. Mint registered 2,451,000 orders in August. The amount, while impressive when compared to a typical month in nearly any year, was nonetheless the second lowest monthly number so far this year. Since their debut in 1986, the investment grade coins have average sales of just over 800,000 per month. However, this number has been significantly skewed in the last few years with Silver Eagle demand reaching record levels. Pull out coin orders in 2008, 2009 and 2010 and the monthly average falls toward 600,000. As the large difference indicates, many of the more recent months and years have seen enormous volumes. In fact, the 19,583,500 sold in 2008 broke the prior annual record. That record was quickly toppled in 2009 when buyers scooped up 28,766,500. Now, lifted by the Silver Eagles sold this past month, 2010 is one step closer to becoming the new record holder with an already 23,600,500 registered through the month of August. That places the annual total within 5,166,000 of last year’s record — and that is with a third of the year still left on the books. To gain the title of best year ever, only 1,291,500 coins need to be sold on average during each remaining month. A lower monthly amount has not been recorded since July 2008. 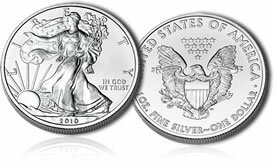 While the August figures do indicate dwindling Silver Eagle interest (with over five hundred thousand less coins ordered than were sold in the previous month of July), it is also not uncommon. As an example, August 2009 sales dropped by 680,000 as compared to July 2009. The decline does offer collectors a small glimmer of hope that the Mint might yet produce the numismatic versions — the 2010 Proof Silver Eagles and the 2010 Uncirculated Silver Eagles. Required by law to strike the bullion eagles to meet demand, the Mint has not yet been able to produce any of the collector versions since 2008. All available Silver Eagle coin blanks have been committed to bullion coin production. Still, it is looking exceedingly likely that the only way the collector versions will get minted is through a change in a law. U.S. Mint Director Ed Moy recommended congressional legislation that would enable the Mint to divert a portion of coin blanks to the proof and uncirculated eagles. Time is running out for that to happen this year unless Congress acts soon. Yes, please keep me informed concerning the production of Proofs and Uncirculated Silver Eagles. Thankss.